Last Friday morning I swam in Bronte pool. At 19 degrees the pool was clear amidst a clear sky, the light and the moment exactly like the moment Leonard Cohen sings of . . . ” There is a crack in everything, that’s how the light gets in . . . ” (Anthem). Diving in, there was just silence in my monkey brain and pure sensual pleasure at being alive. But after the gifted moments I got out of the pool and considered the sea. Then I remembered walking a few days before down the street in Chippendale where I live past four workers and a truck. They were spraying poison on what they called “weed’s in the recently built garden intended only to clean stormwater before sending it away, wasted, to pollute Sydney Harbour and thence to the ocean I was swimming in. We use the ‘weeds’ to cook and make salads with but no longer from there but from our road gardens which we’ve managed to have exempted from the poison spraying. Chickweed that’s shown in the photo below and which they were spraying is a food used in fine restaurants like Tetsuyas and in our own fine kitchens here in Chippo. I smiled thinking of this silliness as I looked out over the pool and the ocean; how else to deal with arrant council naughtiness? Cohen’s right here too where there’s ignorance – even in the spraying and the needlessly dying weeds-that-aren’t there is light getting in – you just have to go for a swim or breath out to find it. Oh well, we’ll stop this useless spraying one day, won’t we? Your statement about “They were spraying poison on what they called ‘weeds’ in the recently built garden intended only to clean stormwater before sending it away, wasted, to pollute Sydney Harbour” didn’t seem quite right to me as water is not wasted by returning to the water cycle, it’s that we don’t make good use of it on its journey, such as harvesting it for irrigating plants. 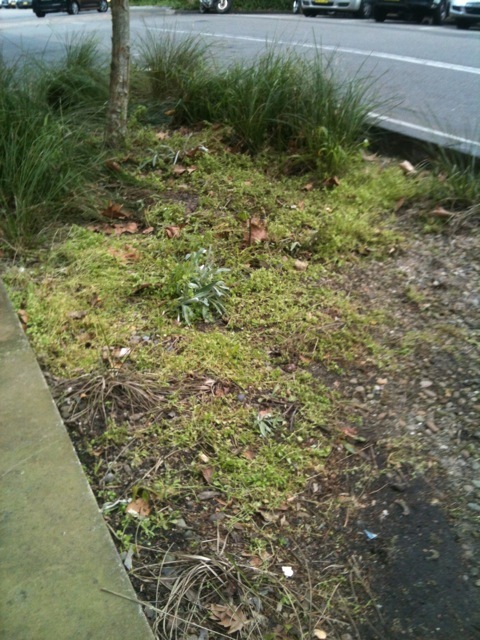 Spraying glysophate in public places troubles colleagues of mine in the Inner West too, Marrickville Council. Councils spray the stuff because it’s cost effective compared to other methods. The feedback I get about the steam weed eradication process is that it is expensive, that the moisture put into the soil could encourage the return and growth of weeds and that the energy required to produce the steam makes for a carbon intensive form of weed control. But maybe they’re asking the wrong question, perhaps it need not be about weed control but letting the weeds, except for the most noxious types, grow. We have to look to bush regenerators, too, when it comes to using glysophate in public places as they seem to have embraced this Monsanto product and use it to paint or spray on what they classify as ‘envronmental weeds’. (as if th urban environment was not a ‘proper’ environment). Once a practice like spraying is establshed in councils it’s hard for them to change course and the only thing that will do that is public prssure.